Kerrigan Advisors has been an endorsed Affinity Partner of the American International Automobile Dealers Association (AIADA) since 2016. Serving our clients nationwide in the most important transaction of their career – the sale. Kerrigan Advisors is the leading sell-side advisor to auto dealers in the US. Since 2015, Kerrigan has sold 71 dealerships, including five of the Top 100 Dealership Groups in the country: Grossinger Auto Group (ranked #95 on Automotive News’ Top 150 Dealership Groups List), Downtown LA Auto Group (ranked #55), The Ron Tonkin Family of Dealerships (ranked #88), the Carbone Auto Group (ranked #94), and the Sam Swope Auto Group (ranked #89). The firm’s executives are licensed investment bankers and have collectively completed transactions worth over $3 billion during their careers. Kerrigan Advisors executives are often keynote speakers at top auto retail conferences, as well as leading manufacturer events. We Serve Sellers. We Know Buyers. Kerrigan Advisors focuses on serving dealership sellers. With our deep industry knowledge and expertise, we customize our client’s sale process to maximize their transaction proceeds. We leverage Kerrigan Advisors’ Buyer Database and extensive industry relationships to identify the right buyers for our client’s stores. Our sale process is highly professional, actively managed, competitive, and – most important – discreet. We do not take listings or build “inventory”. Rather, Kerrigan Advisors focuses on a select number of clients, from valuable single point dealerships to large dealership groups. We care about quality, not quantity. 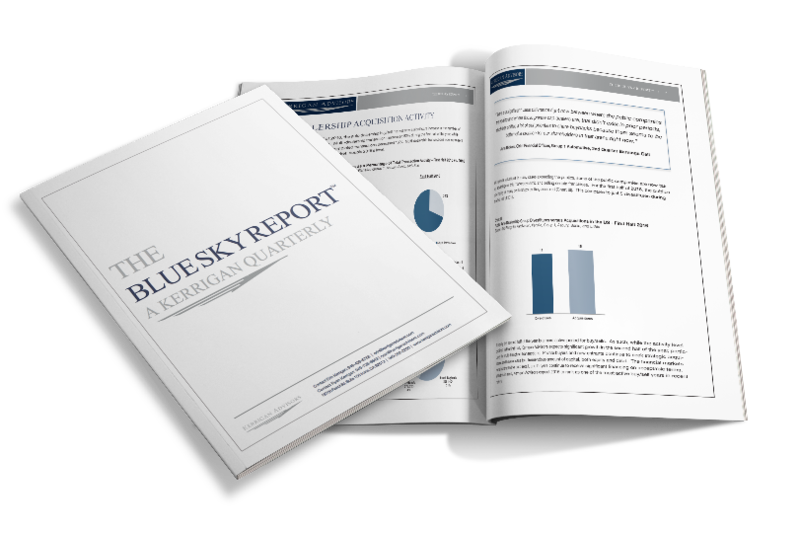 The firm publishes The Blue Sky Report®, the industry authority on blue sky multiples and buy/sell trends. 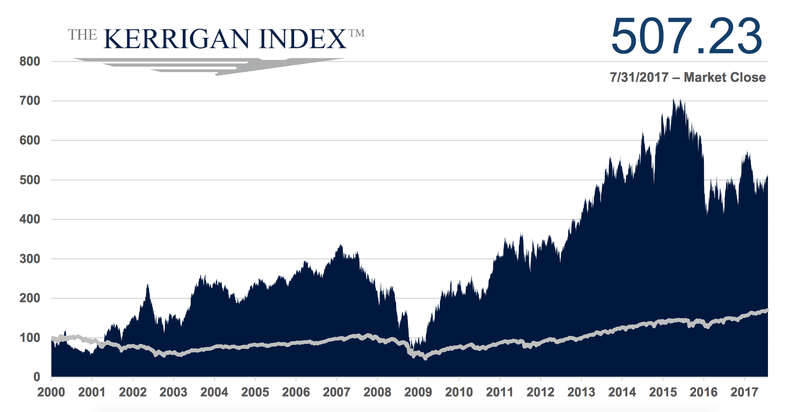 Additionally, Kerrigan Advisors publishes The Kerrigan Index™, comprised of the seven publicly traded auto retailers with operations focused on the US market. Visit our website at www.kerriganadvisors.com to learn more about the firm, its team, and to sign up for Kerrigan’s leading reports. To sign up to receive The Blue Sky Report®, click here. To sign up to receive The Kerrigan Auto Retail Index, click here. If you are a buyer in today’s market, Kerrigan Advisors welcomes the opportunity to learn about your acquisition criteria and include you in Kerrigan’s proprietary Buyer Database. The firm utilizes this database to develop customized buyer lists for each client. In this way, we are limiting the number of buyers we approach on behalf of our clients, to those who we know have an interest in their dealerships. We believe this is the most efficient and effective way to serve our clients and to not waste buyers’ time. In addition to Kerrigan Advisors’ sell-side advisory work, we offer strategic consulting services to auto dealers nationwide. Kerrigan Advisors’ goal is to assist dealers as they make important strategic decisions about their business and help them achieve their long-term financial objectives. We pride ourselves on providing the highest quality advisory services to our clients and serving as a strategic thought partner for important decisions.